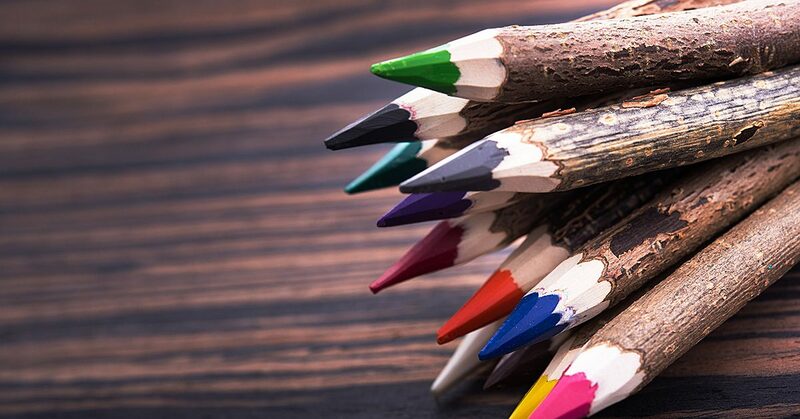 Have you joined the adult coloring mania that is sweeping the nation (possibly the whole world?) You know what I mean right, the movement of grownups using coloring books to Zen out, get calm, and relax? I for one am fully into doing more coloring and less stressing in life. 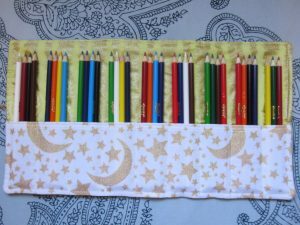 If you want to join the movement, but need a place to store your coloring utensils, then here is a quick DIY for a colored pencil or marker or pen roll. 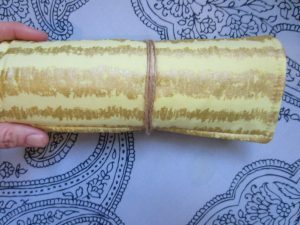 The amount fabric you’ll need for supplies 1-4 depends on how big you are making your roll. 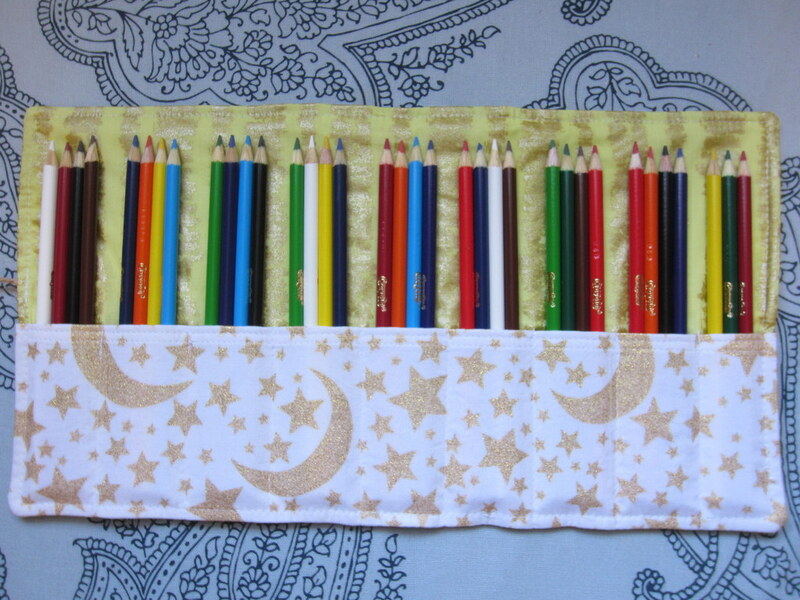 I wanted to include a good assortment of colored pencils (or markers, pens, etc) in mine. 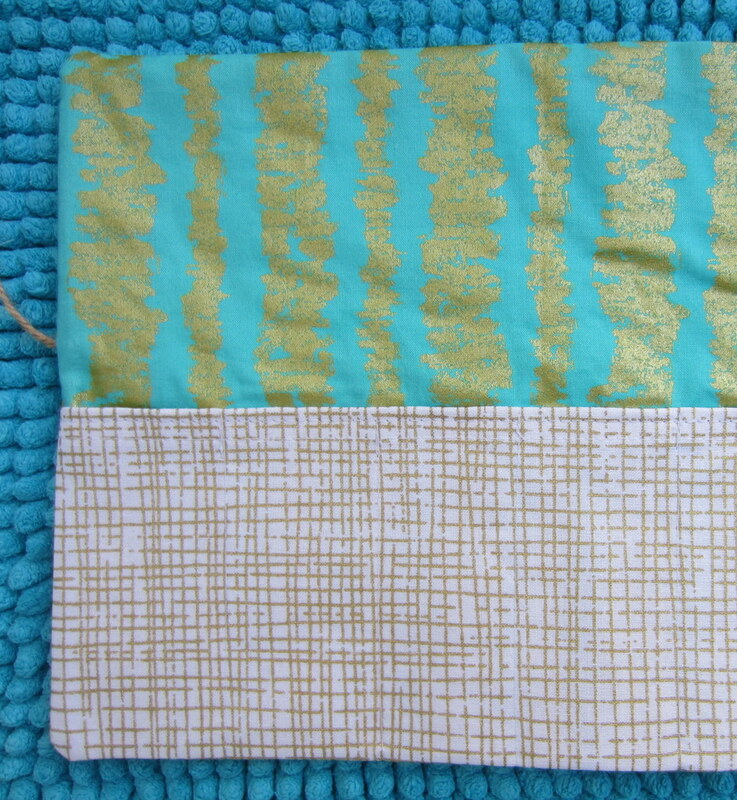 Here are the measurements I used (seams are ¼”). 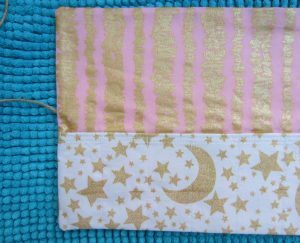 I ironed the interfacing to the back of the smaller front panel of fabric and then folded the top of the fabric over ¼” and then again ¼”, pressed, and then finished the seam. This is the top of the fabric where the pencils will slip in and out of the roll. Then I pinned the smaller front piece to the larger front fabric piece, marked out 1 ¾” spaces and sewed up the front of the smaller panel, back tacking at the top of each line, until I had nine sections. I pinned the layers together and then inserted the twine into the bundle, placing it so it would extend out on the side where the front panel fabric joined the main front panel. I sewed around leaving a section at the top for turning. Pro Tip: heavily stitch back and forth over the twine so it is not easily pulled out. 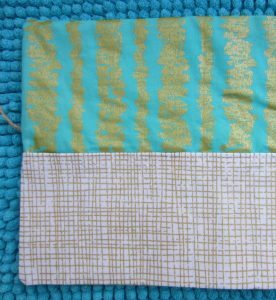 Trim your corners and trim off excess fabric, then turn your piece and use your finger or a seam ripper (with the lid on) to massage out the corners so they pop nicely. Then topstitch. Don’t forget to topstitch! Plan ahead and cut out a lot of a fabric because when your friends see these, they are going to want some. Lastly, slip a bead on the long end of the twine and tie a knot on the end so the bead can’t slip off. Charlotte Kaufman is a writer and sewist in Mammoth Lakes, California. She specializes in marine and home interiors and continues to fall more and more in love with quilting. You can follow her at charlottekaufman.com. 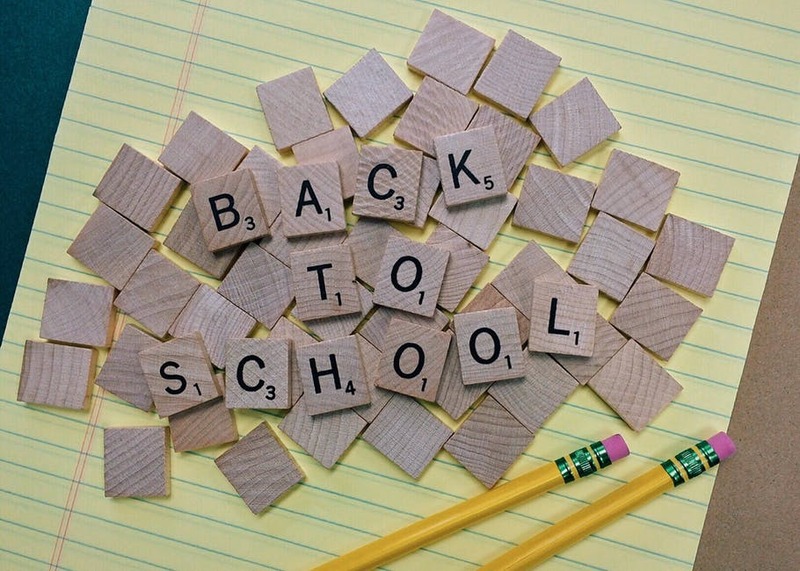 Summer vacation is coming to a close, and the upcoming school year is right around the corner! It’s time to take advantage of your final carefree days beside the pool, sneak in that final family trip, and start focusing on what you need to do to make sure you (or your kids) are READY for school to start again! For me, one of my favorite childhood things about summer wrapping up (maybe the only good thing about summer wrapping up) was school shopping. I loved picking out my notebook and backpack, and finding new clothes that I adore is still something I’m a fan of. But if you want to make your school preparations more personal, don’t overlook the possibility of going just a little homemade this year. 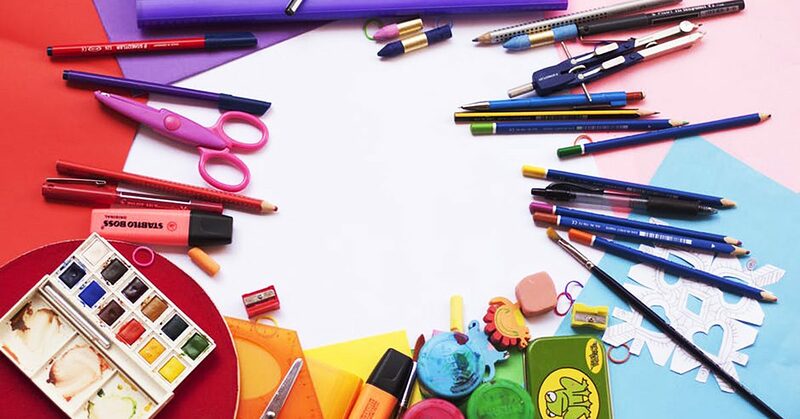 There are definite perks in making your supplies, like being able to tailor the design to your own preferences and the comfort of knowing you (or your child) will be carrying one-of-a-kind school supplies on the first day of school. So if you decide this is the right path for you or your child, here are some ideas for things you can make by hand and/or machine to prepare for the next school year. This isn’t the most complex of ideas, but there are three advantages in creating your own book covers. One, the project is so small that you could make book covers for all your textbooks in one day. That’s some quick school preparation! Two, you’re giving an extra layer of protection to your textbooks, and that lessens the wear and tear they’ll get throughout the year. 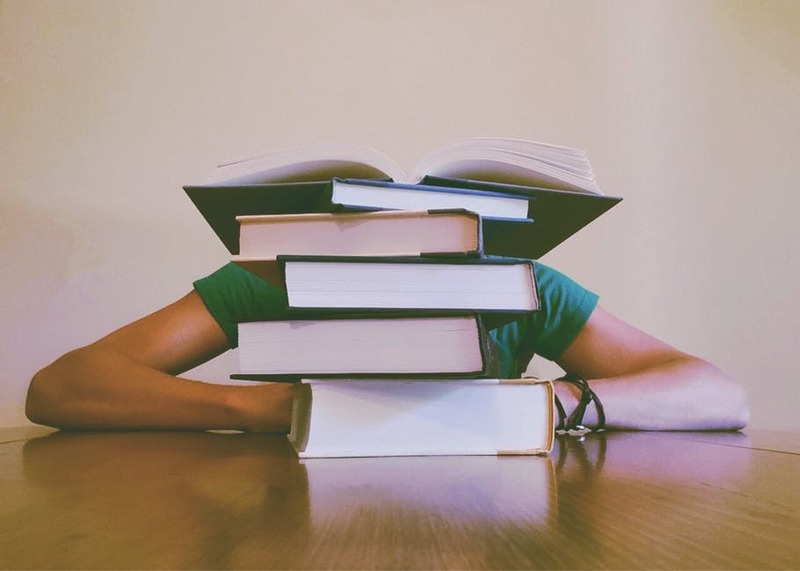 This could save you money in the long run since it could keep you from having to replace textbooks that have been damaged. 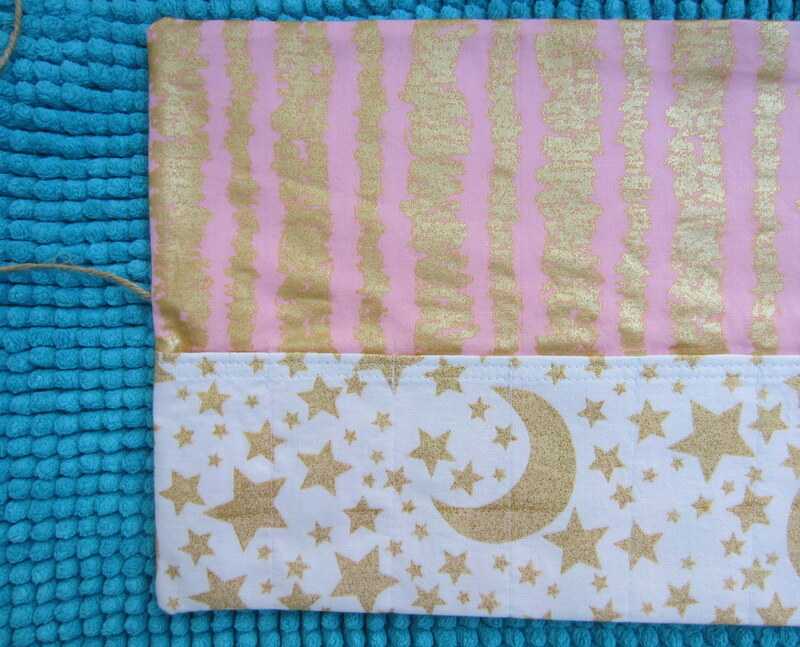 And, third, you can pick your fabrics to make each book something way more personal than your standard textbook cover. Instead of beakers on your chemistry book, you could have prints from your favorite movie—and that could add a touch of brightness to your class every time you grab the book to head that way! This is the simplest idea on the list, but bookmarks can come in handy for keeping your place in the assigned literature classic or giving you a reminder of what chapter you need to read in your history textbook. 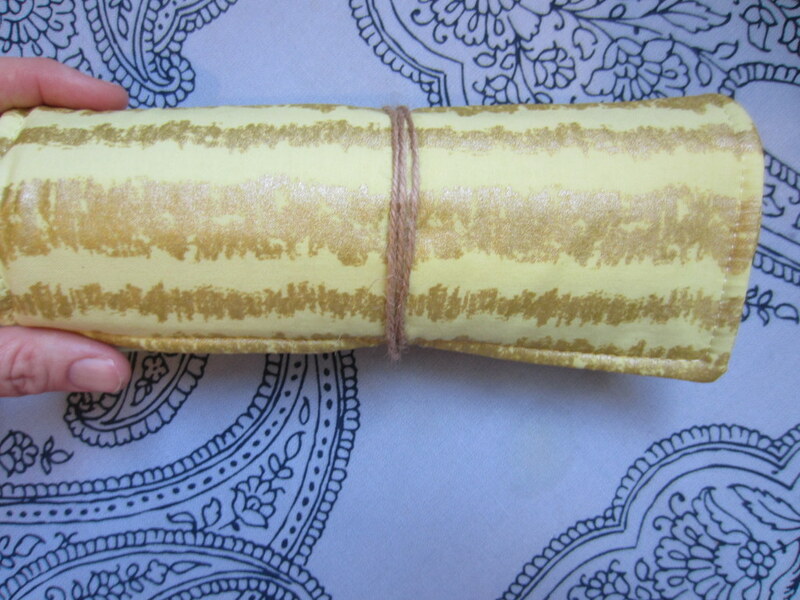 You can spend less time on these than your book covers and use the same fabric to make sure your placeholders match the book you’re keeping your place in. 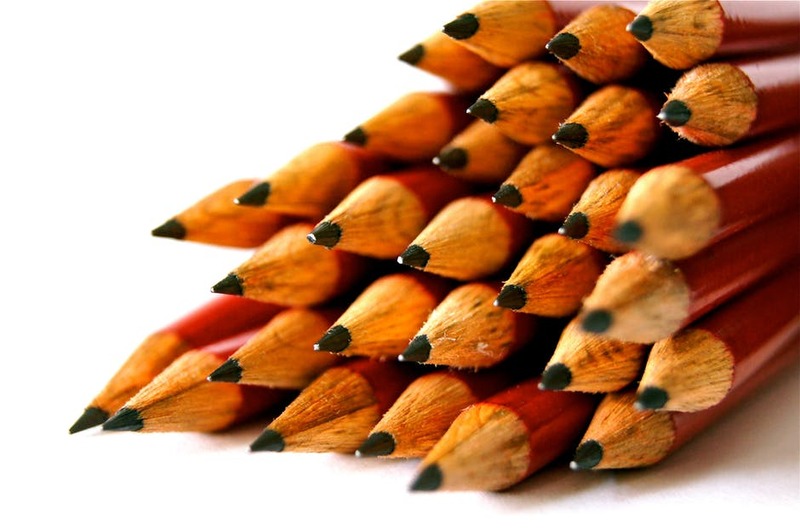 Some of the most essential school supplies are writing utensils—pens, pencils, markers… Something that’s an acceptable tool to write your papers, do your homework, and take your notes. Without them, you might be doomed to bum them from nearby classmates, search your home every time you have an assignment to do, or accept that your grade is going to take an unfortunate turn. 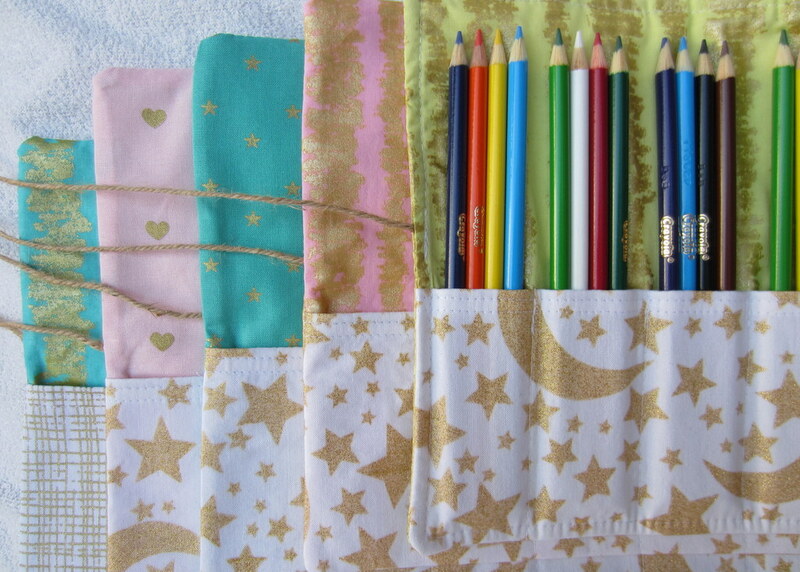 You can use the same fabric once more on your pencil case so that you’re continuing your theme for your supplies, but you’ll need to add a zipper, button, or some other form of closing mechanism to keep those pencils from tumbling out. It’s a simple addition though for another chance to add that homemade quality to your school year. You’re most definitely stepping up the complication factor if you choose to try your hand at a homemade backpack, especially if that backpack will come with a number of compartments. Still, your backpack is the core of your school shopping experience (the only sensible alternative argument would be in favor of your notebook), so by making it yourself, you’re putting a homemade stamp on your school supplies through this one element. 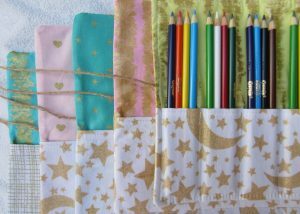 And you can keep your theme of fabric going with this choice by using the same or similar patterns as you did for your book accessories and pencil case! 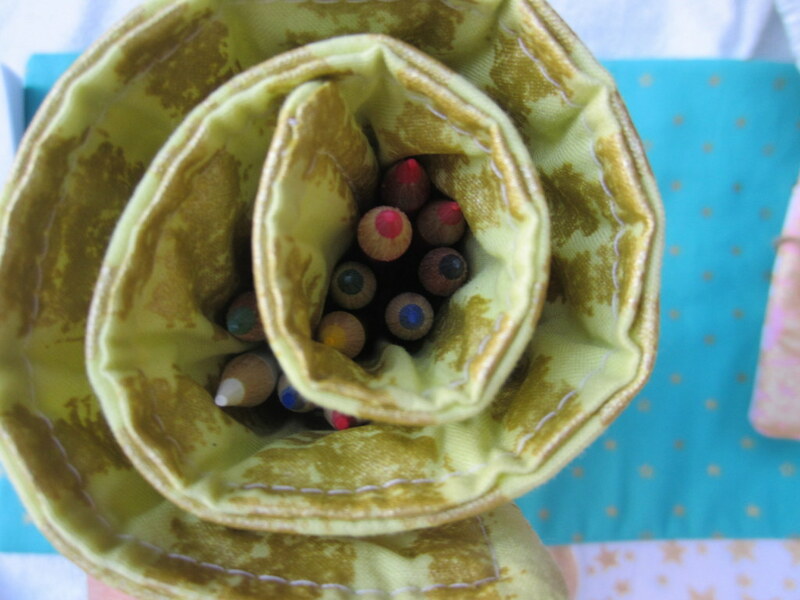 If you used different fabrics for the other supplies, you could make this one the culmination of them by using each and every fabric in some way on your backpack. 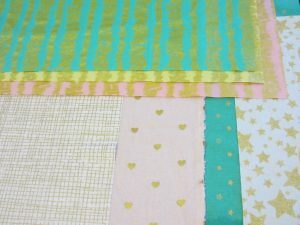 It could be a patchwork feel or a planned-out strategy where each fabric gets its own compartment or section. 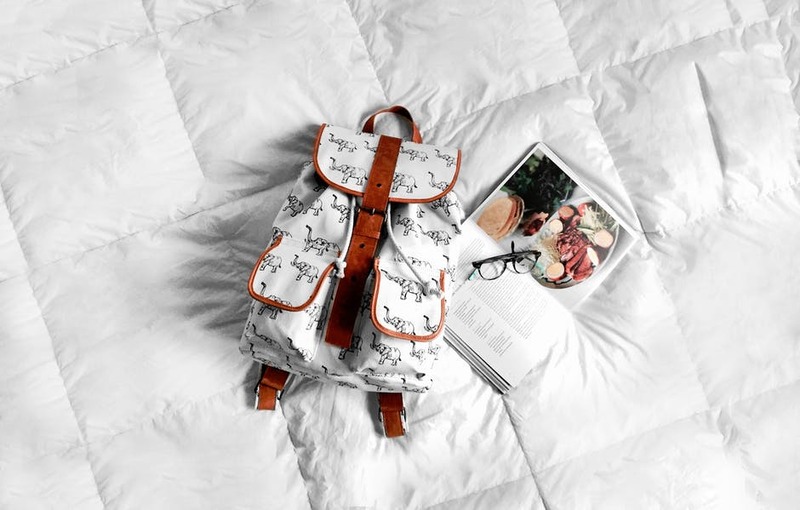 Whether this will be your only homemade contribution to your school supplies or the central part of your homemade approach, choosing to make your own backpack for the upcoming school year could be the perfect project to wrap up your summer vacation. Last but not least, you have the option of making your own outfit. Or two of them. Or three. Or sixteen. If you’d like, make your entire wardrobe—but if you do decide to take that route, you might want to get started ASAP. 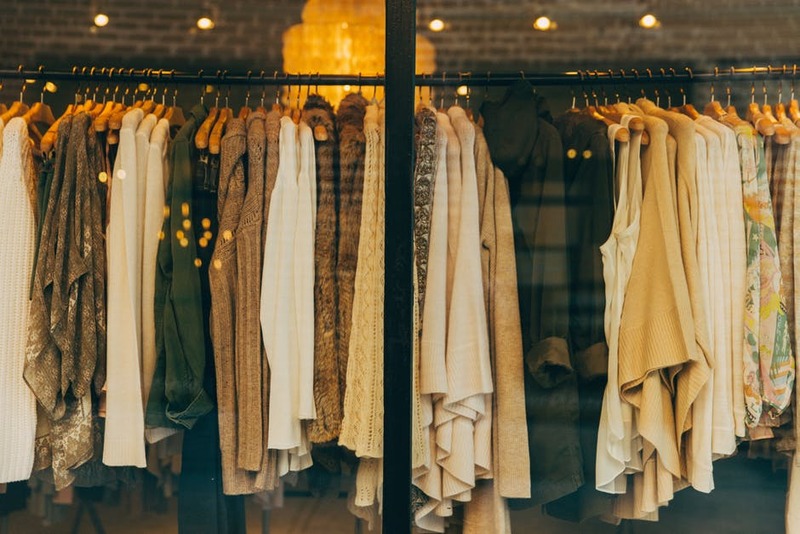 The school year is soon coming, and a wardrobe can be a time-consuming thing to make! 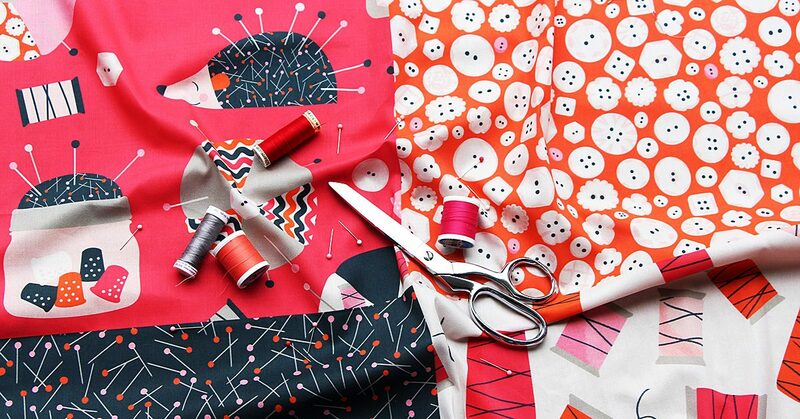 Browse fabrics and patterns to find combinations that you can see yourself wearing, and get to sewing! With these supplies ready to go, you’re equipped for a one-of-a-kind, homemade first day of school! Some things just work better in pairs. Some things just work better in pairs—like shoes, socks, friendship bracelets, and the Everly Brothers. Often though, even our pastimes can be enhanced by the addition of another human being. Going to the movies, as an example, is more fun with a friend to offer ridiculous comments to or to discuss the movie with after the credits roll. Another example would be hiking. It could be great for you to wander through nature while getting a workout, but if you have someone to share the experience with, that company provides another level of goodness. Sewing, too, can benefit from the presence of another person, even if people often think of it like a solo task. Things like classes based on sewing show evidence of this since you’ll be learning—should you take one—in the midst of other people who are interested in the same craft, but the reasons behind sewing non-solo are applicable beyond the notion of gathering in dozens in a classroom. 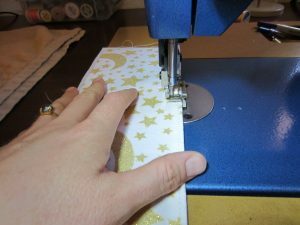 Truthfully, there are common, day-to-day rationales for having a sewing friend or two in your life that you could find useful even if you don’t want to leave your house for your projects. You can pick up your phone, call them, and invite them over for sewing assistance. And that sewing assistance can come in three specific forms that we’ll cover in this post. Ready to dive in? Then let’s go! You might find that getting your measurements on your own can be complicated. 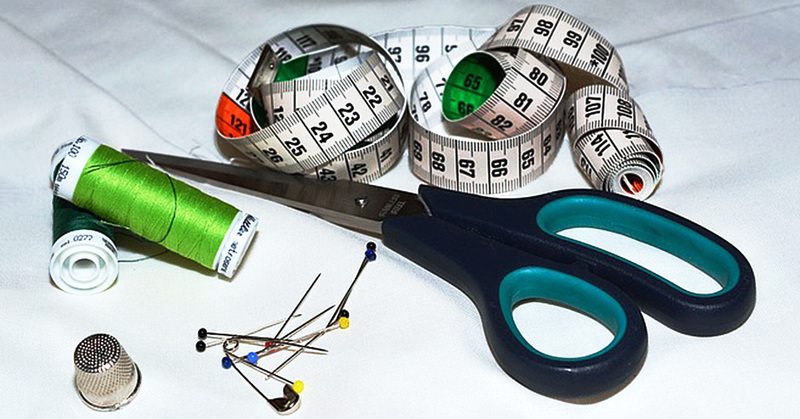 If you’re the type of person who sews your own clothes, you might find that getting your measurements on your own can be complicated. If you try to measure from shoulder to shoulder, for instance, you pretty much have to lift at least one shoulder, and that can throw off your measurement. It helps then to have a second person around who can step in and help you. Now, sure, you can recruit whoever is around to help you get that shoulder measurement, but it’s still best to have that someone be a person who’s familiar with sewing. 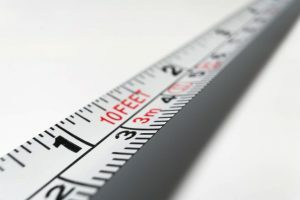 The reason for that detail is because people who are accustomed to taking measurements won’t need an explanation about how to take the measurement. They’ll understand, if you want help with your waist measurement, that the sewing tape should be at the smallest part of your waist. The process is familiar, and they’re accustomed enough to know how tight the tape should be held as well as where the cut off is in regard to any kind of tape-overlap. 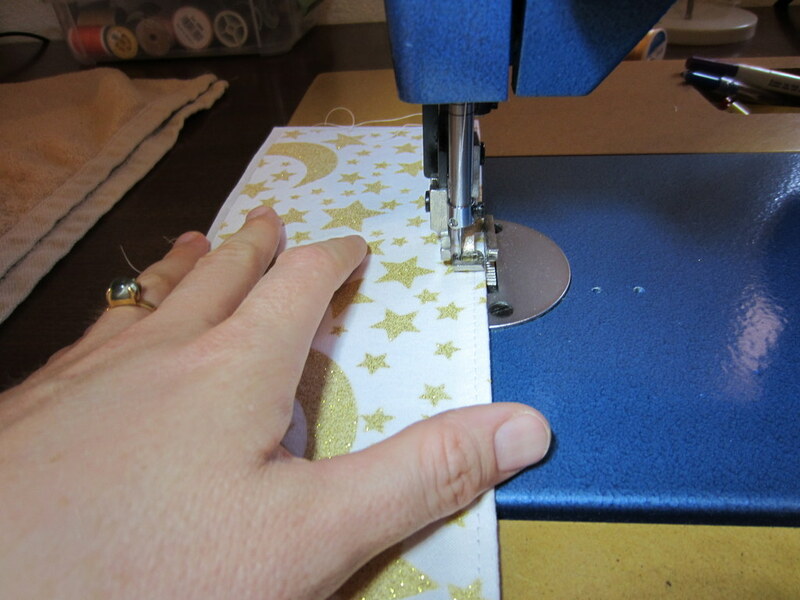 That familiarity can make for not only an easier sewing experience, but also a more accurate one. A non-sewing friend might allow too much slack and cause your clothes to be too big. To go Goldilocks, the sewing friend might measure just right. Sure, you shouldn’t be the person who constantly asks to borrow things—particularly if you don’t return them. 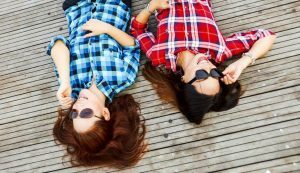 But if you’re in a situation where you’re friends with someone you share an interest with and both of you trust the other enough to loan supplies, this can be a very real benefit for you and the person your friends with. If you don’t have the right shade of blue in thread, maybe your friend has it! If your friend doesn’t have a specific sewing needle for a task, perhaps you have one! It’s a great back-and-forth situation where you’re being afforded the opportunity to have a go-to for supplies you need who’s just a phone call away. This dips into shopping as well since shopping with your friend could help each of you be aware of what the other has in their supply for these sharing moments. Of course, this wouldn’t be the only reason to go shopping for sewing supplies together, but it’s a definite plus! 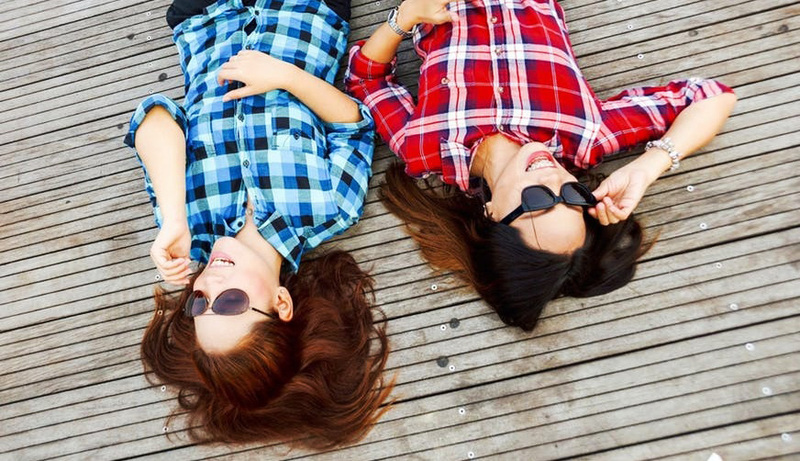 Either way though, in addition to sharing the supplies, you can share the experience of finding the right supplies with a good friend—and what shopping trip isn’t more fun with a friend?! Brainstorm ideas to come up with the best projects you can make. Any time you have an interest, it can be nice to have someone to talk to about that aspect of your life. Otherwise, you might find that you have nowhere to turn to discuss interesting or pressing matters in regard to the field. It’s like being an avid reader who finishes a really great book, but then has no one to talk to about that book. You have all of these thoughts, opinions, and reactions, and where exactly are you supposed to send them? Sewing can be so similar because you pour so much of yourself and your time into your projects. It helps to have someone there to talk to about your progress, your confusions, or your plans. 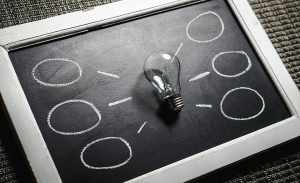 The process can help you brainstorm ideas to come up with the best projects you can make, and it can give you a place to offer your complications in a way where you can ease your tension. You might even get some insight about what to do to fix those complications rather than bottling them up until they potentially run you down so much that you throw in your sewing thread. 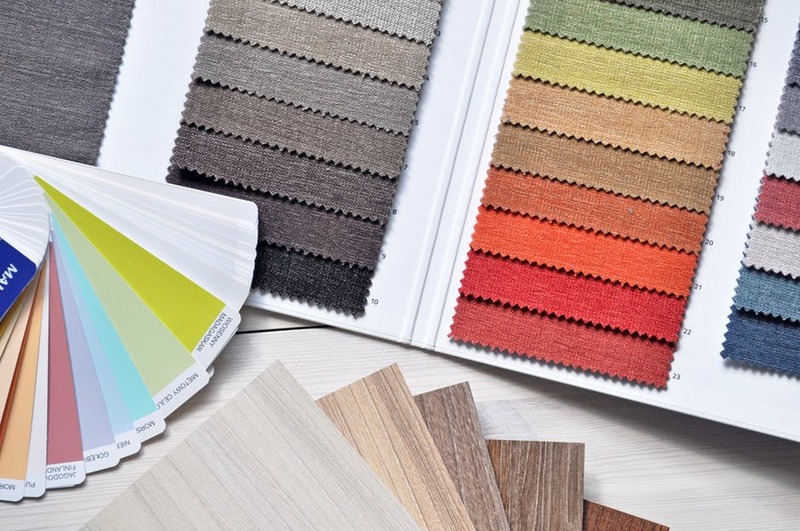 This social quality can then better your sewing experiences, and it can also increase your odds of continuing your sewing endeavors. That makes it a definite advantage of having a friend who sews! Bottom line? 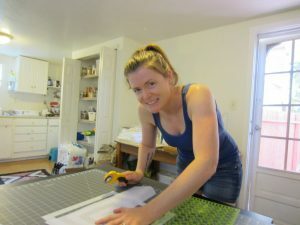 Don’t think of sewing as an exclusively solo gig! 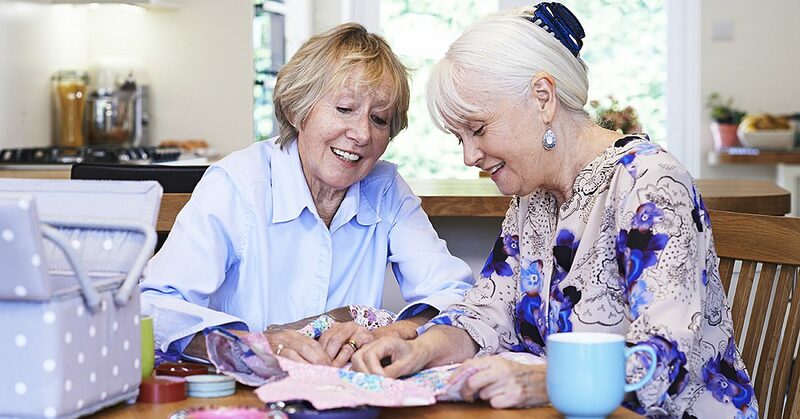 Having that sewing friend can make for a brighter, easier sewing experience—from shopping for supplies to putting together your projects. You might have to sign up for a class to find that friend, but trust me! They could be worth their weight in sewing thread! Last week, I told you about my dream sewing room furniture. 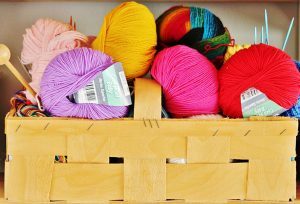 This week, I want to share with you my must have sewing supplies. And no, I don’t actually own all of them since I don’t yet have that dream sewing room. Call this my dream sewing supplies list, I guess. I adore making cute summer sundresses. Right now, I measure myself, cut along what I hope are the right lines in the pattern and hem it by hanging the dress on closet hanger. Not ideal, but so far at least, they’ve all come out fine. I’d love a dress form though so I could check the fit and make minor tweaks and modifications as I go. I’m kind of between dress form sizes right now, so I’d have to make a call on which size to get – or if money was really no object, just get both! Alright, so I do have a pair of fabric scissors. I couldn’t consider myself a sewer if I didn’t. But I don’t love them. The handles are hard plastic and someone (not naming any names) used them to cut paper at some point, which kind of screwed up the cutting surface. I’d really love a pair of fabric scissors with a softer handle, especially since breaking my right hand last year. Even better, the ones I linked to have a purple handle! That’s my favorite color. Definitely on my sewing supplies wish list. I don’t necessarily need to cut long, straight lines making sundresses, but I do need to measure long stretches of fabric to line up pattern pieces. Right now, I use a soft measuring tape. I pin it down on one side and pull it taut to measure. It’s not ideal, but it gets the job done. A yard stick or long ruler would go a long way towards making measuring easier. 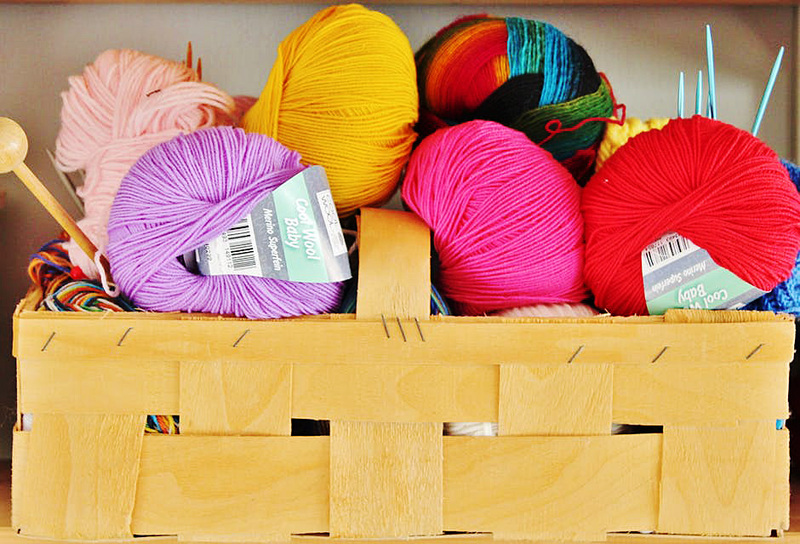 What’s on your sewing supplies wish list? Sewing Machines Plus probably has it! Check out the website and let yourself dream. I’m lucky enough to have an October birthday, which is the inspiration for this post. But whether you or the sewer in your life has an October birthday or any of the other 11 months of the year, they’ll love these birthday gifts and use them all year long. If you happen to know the particular brand of machine, or can lay your hands on universal needles, these make a great gift. 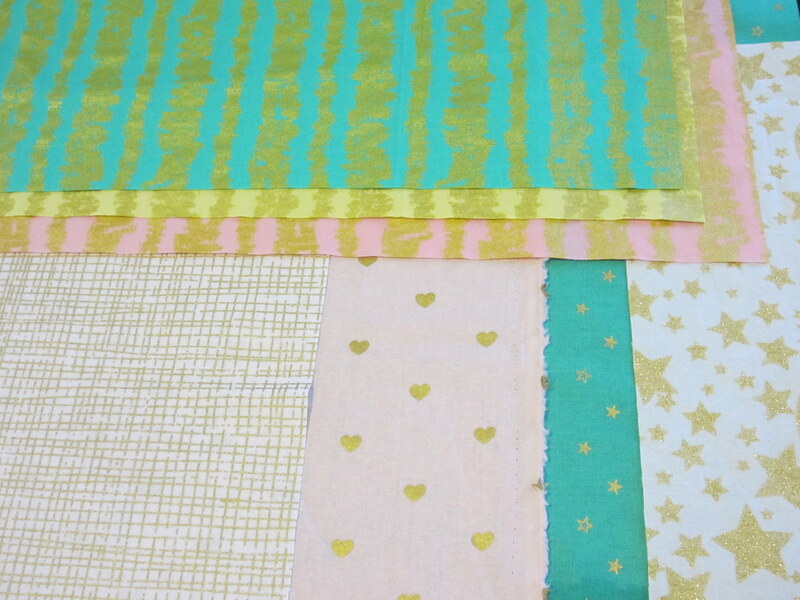 Get a variety of sizes suitable for many fabric types. Sewers know that machine needles break and get dull, so a package or two of machine needles to replace the ones they’ve gone through will be greatly appreciated. If the sewer you’re buying a gift for makes a lot of clothes a dress form will be a gift straight from heaven. These aren’t inexpensive so most casual sewers don’t invest in them, but they make the process of sewing a dress much easier and help make sure they’re sized correctly and will fit as expected. Look for one close to the sewer’s size. They’re adjustable, but only to a point. The larger the better. These mats are amazing! If the sewer in your life uses a rotary cutter, a self-healing mat protects the table, floor or other surfaces. Quilters use these a lot and may need to put several together to make a mat the size of the finished quilt. Get a few so they can make whatever size they need. Straight pins are essential for every sewer. They hold the sides or pieces of fabric together while they sew over them with the machine. Sometimes, the pins get bent in the process. They also get dull over time. A package of these is inexpensive and will be greatly appreciated by the sewer in your life. Your sewer likely has numerous spools of thread, bobbins, buttons and innumerable other supplies. A set of clear plastic boxes in various sizes will help her organize them while keeping her supplies visible and easily accessible. There’s a huge variety of sewing books available. You can get a collection of patterns, tips on fitting, advanced fabric guides or a variety of other sewing related books. Depending on what interests your sewer has, you can find a book, or books, to suit. What sewer doesn’t love a craft or fabric store shopping spree? 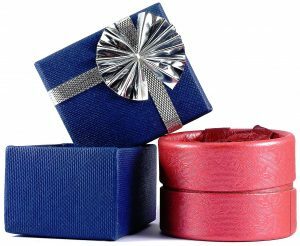 If you’re not sure what to get the sewer in your life, gift certificates to the local craft or fabric store will be greatly appreciated. They can revel in fabrics, poke through threads and notions, and flip through patterns to their heart’s content. If the sewer in your life is dreaming about learning a particular technique, sign them up for a class. They’ll love the chance to learn something new and appreciate the thought you put into the gift. And who knows, maybe they’ll make you something to boot! 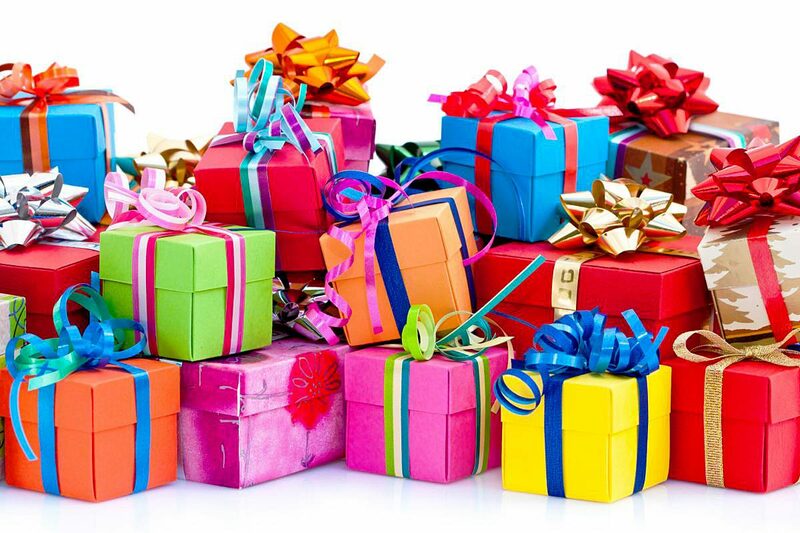 What other gift ideas do you have?